Persona Development– where to begin? The answer to this question is amazingly diverse. It begins with, “what do you like?” and “what do you want?” and everything else will follow. 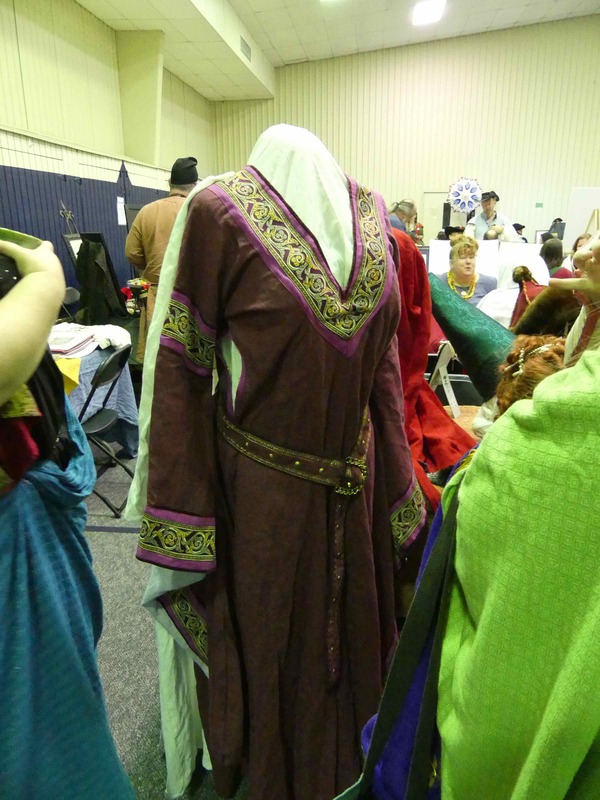 Case: a lovely member of the SCA is into spinning and weaving. She finds a particular period in which the methods and materials are well documented and dives into a new aspect of her passion for spinning. She learns to card weave to produce her own trim, which she is careful to match fiber to fiber so that everything shrinks at the same rate. She studies period methods of dyeing the fiber. She gets a small period correct loom. She makes some garb to go with this persona. Case: a gentleman takes up the practices of Chivalry. He goes to fighter practice, loves it, and makes his own armor. He stays with it, wearing the same simple t-tunic he sewed first. However, he discovers a book by Dr. Timothy Dawson titled, ARMOUR NEVER WEARIES SCALE AND LAMELLAR ARMOUR IN THE WEST FROM THE BRONZE AGE TO THE 19TH CENTURY. He is hooked on lamellar armour. He creates his own armor and that requires some new garb. He discovers Sartor, a fabric company that recreates period fabrics and gets a piece of brocade from his period and culture and uses it to trim his “court garb”. Suddenly his persona has begun to develop! Case: a young college student comes to a garb session and sits down with some books that trace clothing styles through various time periods and cultures. She spots a dress. THE dress, that dress that she wants bad enough to buy linen instead of cheaper cotton, and spend hours sewing. The DRESS sets her time period and culture. From there she learns about the foods available and how they were preserved and joins the cooking guild. She even hunts down some herbs that were commonly used by her persona and grows them in pots on the window sill of her apartment. 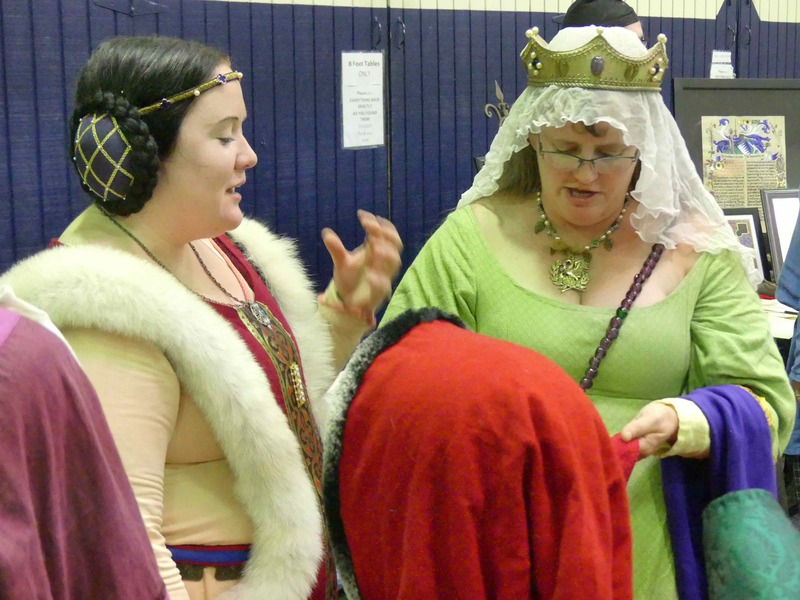 The photos are by Anna Maleine and were taken at the Laurel’s Prize Tourney in Ansteorra. This is the artisan Murienne Corbeau discussing her work with Mistress Kaitlyn. My last case is me. I am fascinated by the writings of Early Christians. In grad school the course was Patristics. The Cappadocian Fathers were incredible to read and fascinating to learn about. I wanted my persona to read, and to live where she could read early Christian writers like these. So, Eastern Roman, 10th century during the reign of an emperor powerful enough to secure the borders and create peace enough for a reflowering of learning and art. Geography, Culture, Art, Clothing, Armor, Method of fighting (rapier is later period), Equestrian, Fiber Arts, Ethnicity, Gardening, Cooking, Metal Working, Wood Working, Chivalry, Knights, Education, Books, Authors, Artists….the starting points are as varied as the amazing people who enter the SCA.